A guide to solving old problems with new solutions. This guide is under construction. Content will be added and updated as time goes on. Unlinked titles are planned but not yet complete. If you are interested in learning more, asking questions, or networking with other teachers who are tech focused, there is a Facebook group that I have created to go with this guide. Please check it out and request permission to join. Technology First: Background, Concept, and Results: What is "Technology First"? Eating Your Own Dog Food - Why teachers, students, and administrators should all use the same tools and technology. 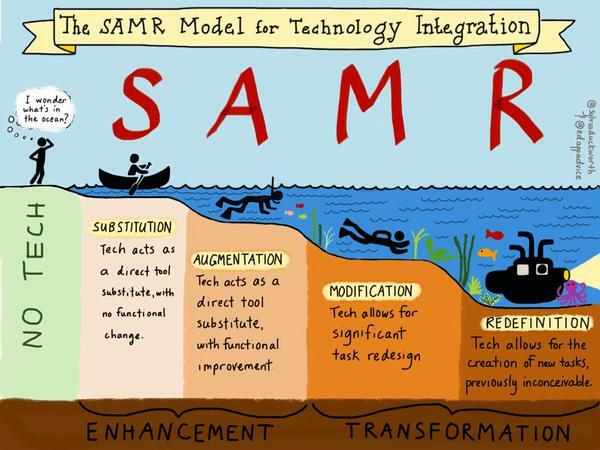 Taxonomies for Technology Integration: SAMR and TPACK - How to calibrate where your skills and your lessons are vs. where they need to go. Elsewhere on this blog there is a guide to building your own "Personal Learning Network" with Twitter. I call this Twitterversity. Check it out.